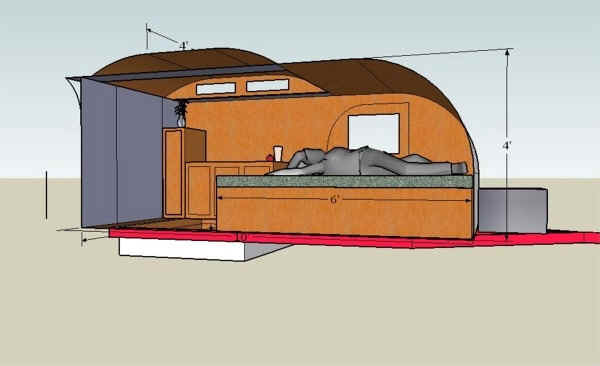 The Teardrop Cruiser II is an original Teardrop trailer design. This design is under © copyright 9/15/2006. 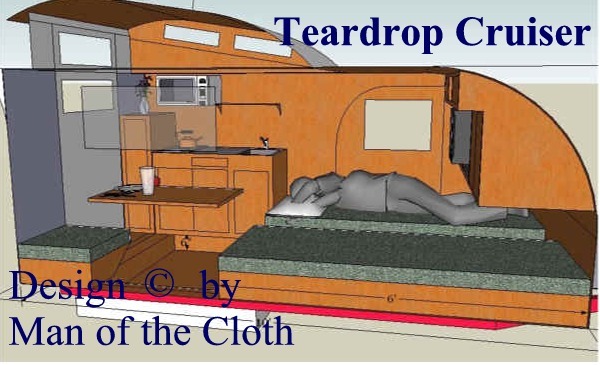 Please contact me if you are interested in seeing more of the Teardrop Cruiser II design or using it in your own construction of a Teardrop. 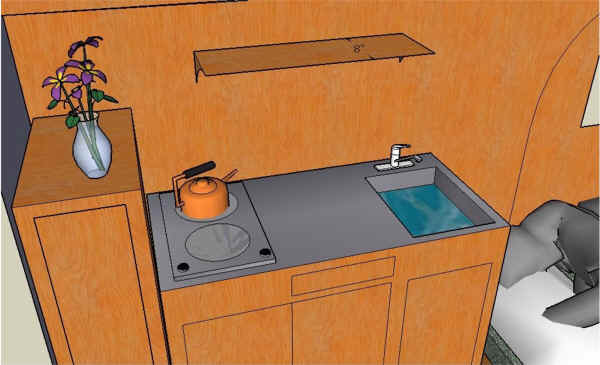 A table, galley with sink and stove. For ease of construction I made a few changes to the overall size and to the top of the design. 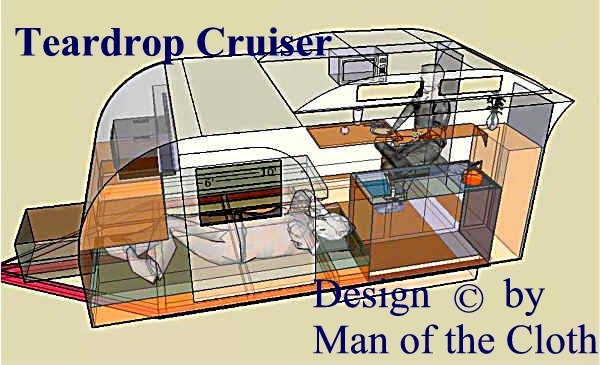 This version of the Cruiser is built on a 5X8' frame. 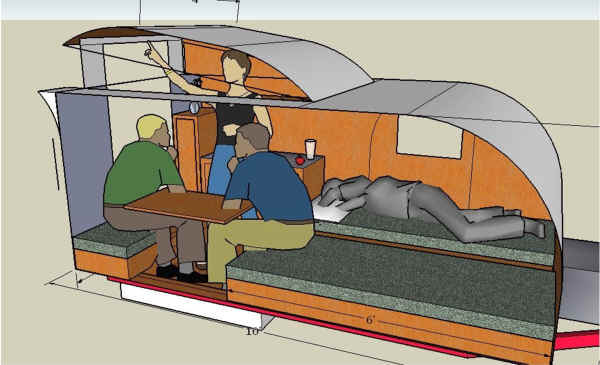 The cabin extends over the frame and the lifting hatch is just the clerestory windows, so it weighs less. The clerestory is 4 ' wide. The box at the front is the air conditioner. 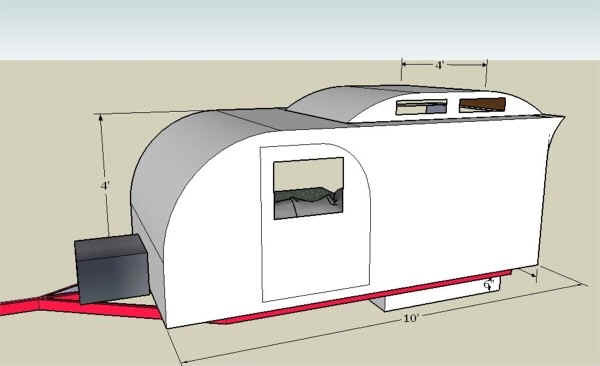 This shows the way the clerestory closes and meets the overhand at the back. But the nice thing is that the top lifts. 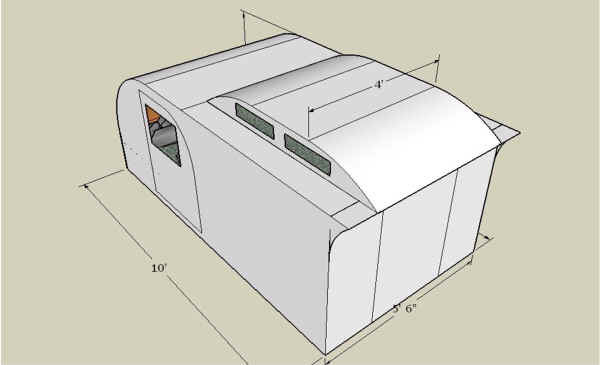 Two triangular side panels drop down on hinges, and the small top of the Dutch door lifts up. A table can be mounted with a hinge on the wall. Folded it up for meals, reading or games. 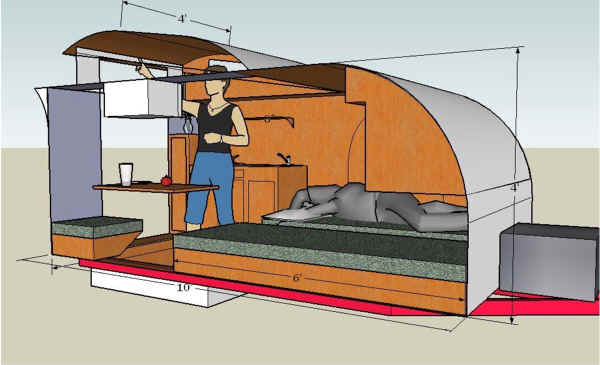 Drop it down for more room. 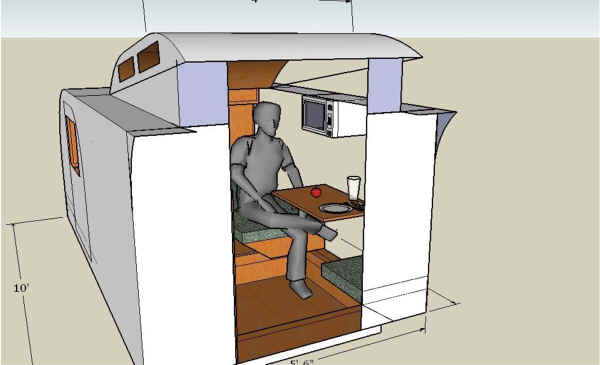 A small microwave could be mounted on the wall above the table. 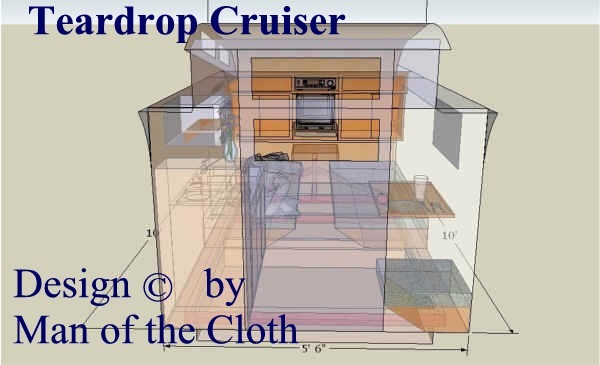 A small galley provides the basics for cooking and the clerestory windows allow for easy ventilation. 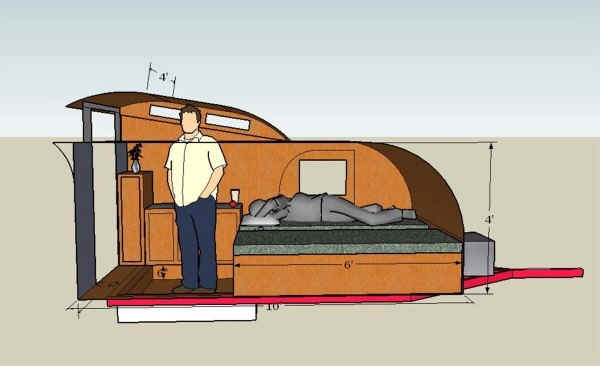 Two people could easily tour and camp in the Teardrop Cruiser. 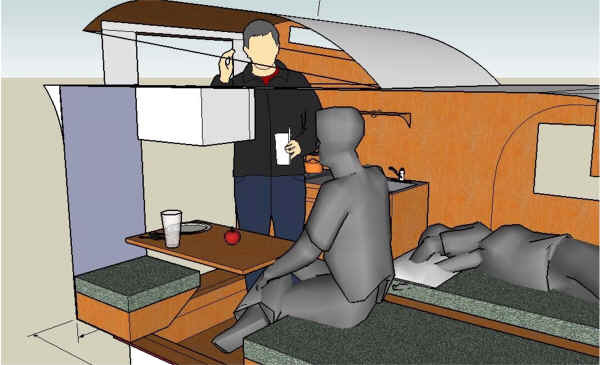 When top closed, there is still easy access to the galley area. Open a top window and make a cup of coffee while you watch the morning news on TV! 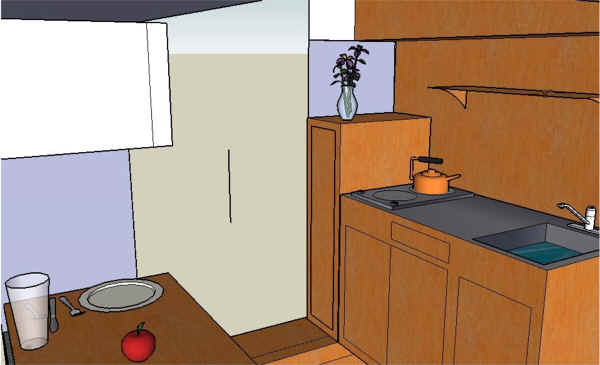 In the next sketch I moved the microwave above the stove top. This clears the view at the table. 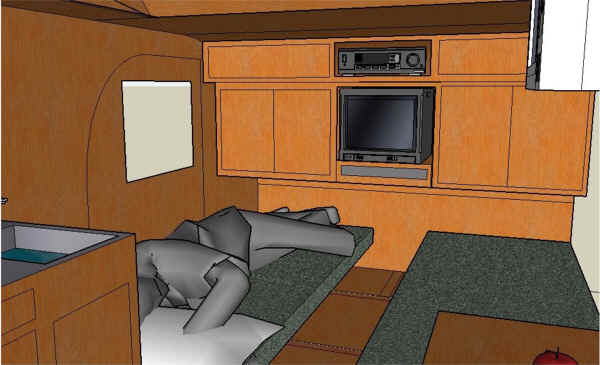 The Cruiser has two bunks. 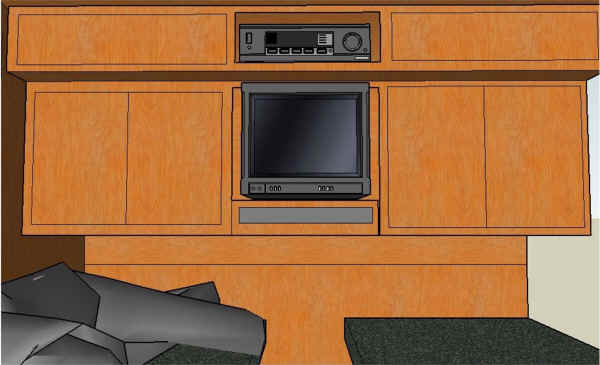 Clothes can be stored under a lift lid below the cushion or in the cabin cabinets. 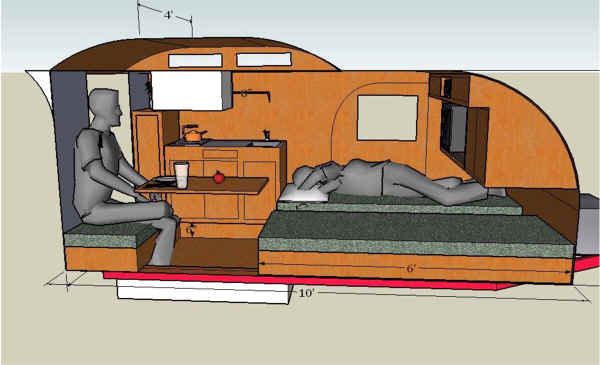 There is over a foot of room between the bunks. 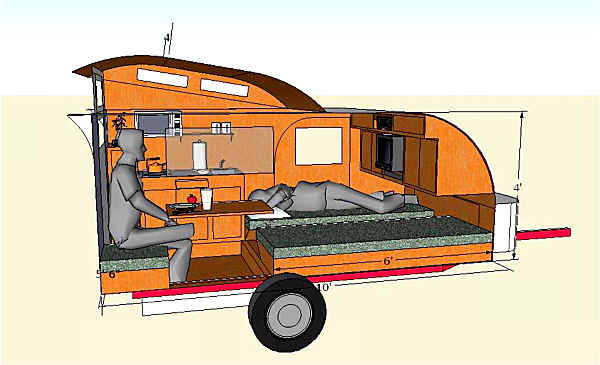 One or two side doors make it easy to enter the Cruiser if the top is down and also provide a quick exit in case of a fire near the rear door.